Purification workbench is a kind of purification equipment which is frequently used in laboratory. 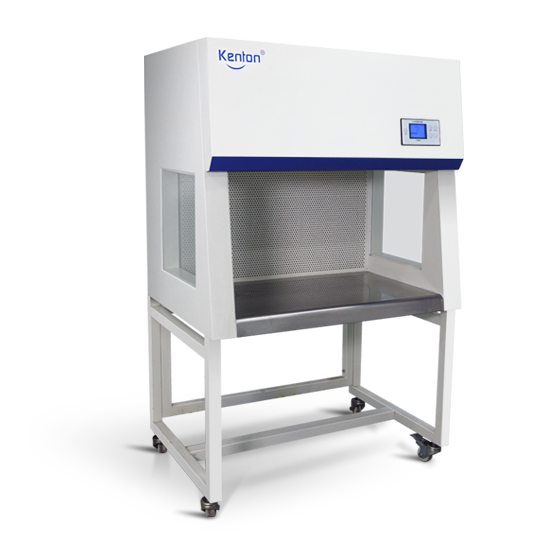 It can provide a local clean and sterile working environment for staff to test, so as to protect samples or test products from being infected and leaked to pollute the surrounding area. At present, the most common types of purification workbench are horizontal and vertical, which can meet the different needs of all walks of life. JHZ series of vertical purification workbench is a new type of purification workbench developed recently by Guangzhou Kangheng Instrument Co., Ltd. based on years of experience in producing purification workbench. 1. The box body is made of high-quality cold-rolled sheet, the surface of which is electrostatic sprayed with plastic, and the shape is beautiful. The countertop and back sides of the operation area are made of stainless steel plate, which is easy to clean. 2. The control part is controlled by micro-computer. The integrated instrument design structure makes your operation simple and intuitive. And the display screen can display all kinds of working state, which is easy to master and adjust. 3. The use of ultra-high efficiency filter without partition makes the cleanliness up to 100 grade. 4. The front part is designed to be 10 degrees inclined in accordance with human mechanics to make the operation more comfortable. The transparent glass observation front window enables the user to move and set the opening height arbitrarily within the prescribed range, which not only facilitates the taking and placing of items, but also ensures the operation needs. 5. The working area is equipped with ultraviolet sterilizing lamp, one standard power outlet and one water vapor valve, which provide convenience for the experimental requirements. 1. In order to ensure the long-term normal use of clean workbench, the filter material of primary filter should be removed and cleaned regularly (generally 4-6 months) according to the degree of environmental cleanliness. 2. If the wind speed in the working area is less than 0.08 m/s, the high efficiency air filter must be replaced. Replacement of high efficiency filters can be purchased from our company. Attention should be paid to the arrow mark on the high efficiency filter when replacing. The arrow points to the laminar flow direction. 3. The primary filter is made of treated 5-8mm non-woven fabric, which is pressed firmly with metal mesh and installed at the air inlet. 4. Clean up the pollution after the replacement, start the fan to check the leakage of the filter and the air flow. When there is no fault, it can be put into use. 5. It is strictly forbidden to change the internal structure of the equipment. If quality problems occur, please contact our after-sales department. 6. Care must be taken to avoid collision so as to avoid damage. 7. When the equipment is not in use, the user is advised to dial down the power plug or turn off the main power switch. As a laboratory equipment often used to protect personnel, it not only has high technical requirements, but also has regular maintenance and management. Only in this way can the equipment have a good working efficiency and service life.